I have decided to start a weekly Back To Basics Series for my readers. 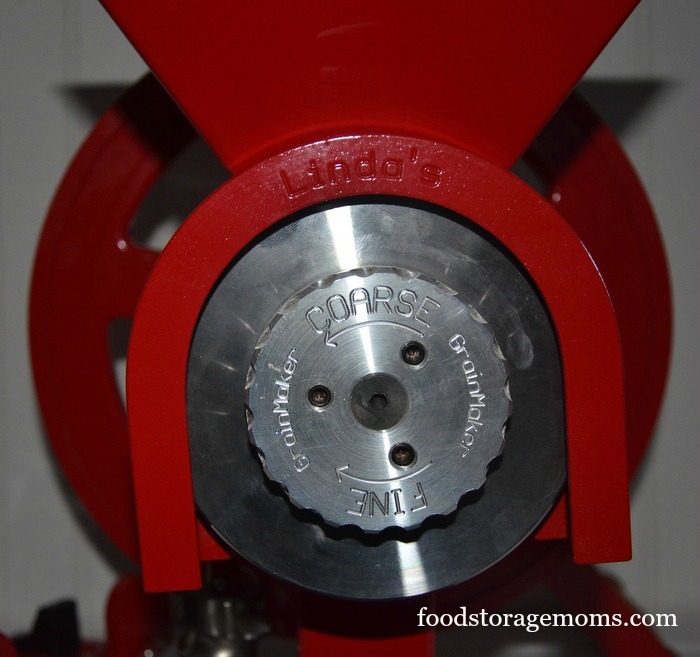 Today’s post is about wheat grinders. Here’s the deal, I feel a sense of urgency to teach people many things to help them become more self-reliant. I realize a lot of people know several self-reliant tips, but I learn great tips from my readers and I want to return the favor. I am going to share what I know and I would love to hear tips from you. I will post your new tips on the post of the week. I will start writing a new Back To Basics post every Thursday. So let’s get started with wheat grinders/mills today. One is electric and grinds/mills wheat to make flour only. The other hand-powered one can grind/mill grains, make cereal, nut butters and so much more. As the story goes, Bonnie Jones wanted to start being more self-reliant and decided she should have a hand operated grain mill to be the best prepared. She and her husband Randy looked all around for a good quality one they could rely on. After much searching they never come up with a unit they liked. Randy decided to build one on his own, and thus was born The GrainMaker Mill. That was back in 1998 and no one ever thought it would become the basis for a variety of products that are sold all over the world from their plant in Stevensville, Montana. 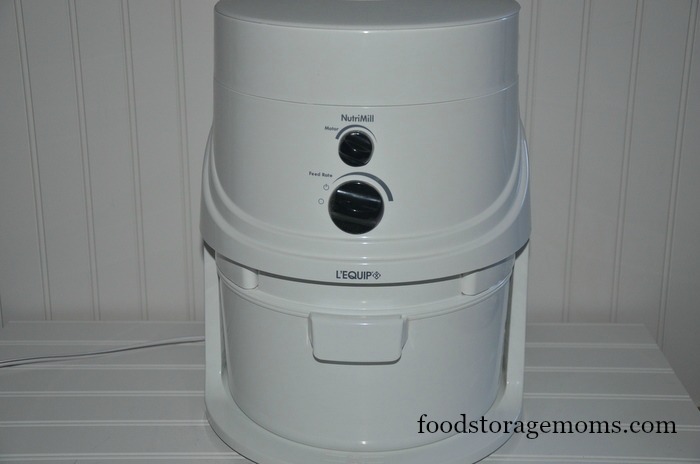 The company affectionately refers to the GrainMaker Mill as “Hand-Powered Goodness” GrainMaker Mill Website. I am almost giddy over this mill. I saved my money for two years to buy it. I always try to look into the future when I make purchases of any significant size. 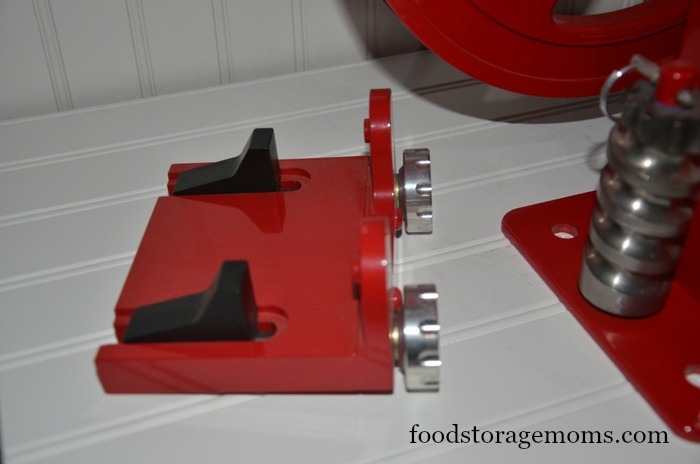 My food storage standards are pretty high and I looked high and low for just the right hand-powered crank mill. This is the one I chose. I absolutely love how it works and the quality is top notch! Wheat: hard red winter, soft red winter, hard red spring, hard white, soft white and Durum. You can also grind Kamut (Trademark) and Spelt. Corn: my friend Kathleen grinds her own corn and makes the best cornbread in the world. Rye: I love making rye bread and you will too. Rice: you can make rice flour and use it as a thickening agent. 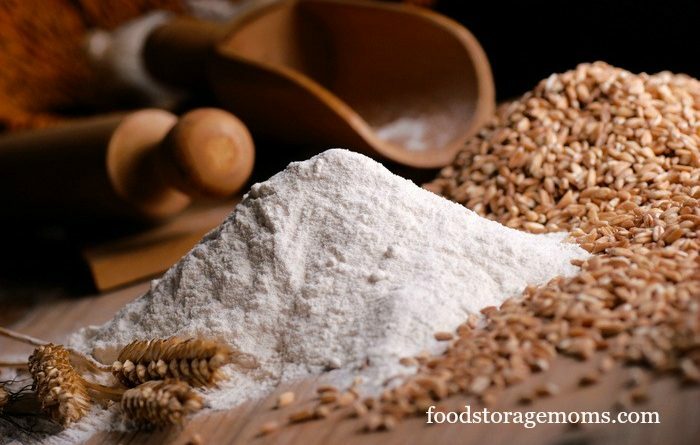 Barley, Buckwheat, Quinoa and Millett: see how many different grains we can mill? Oat, Groats: so many people are using oat flour these days. 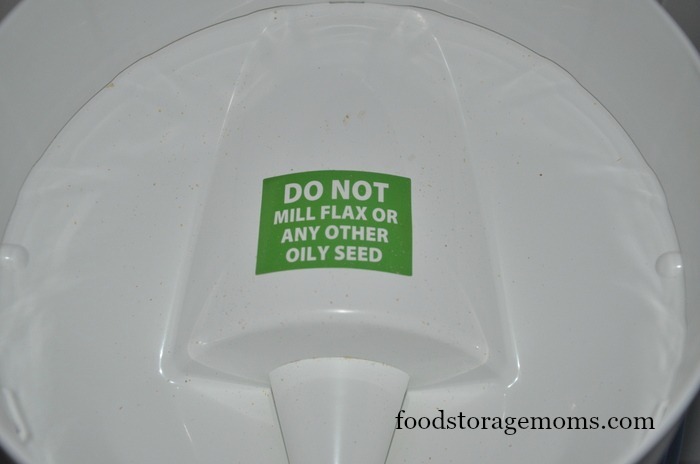 Flaxseed: yes you can grind Flaxseed in this baby! 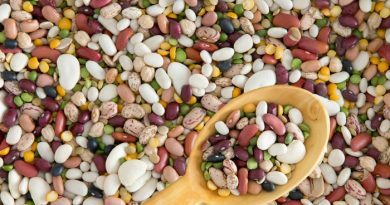 Beans: bean flour is great for those with gluten issues (use the GrainBreaker auger). Nuts: (not refrigerated or frozen ones, let them rest until they are room temperature) Do you love nut butters as much as I do? Dehydrated tomatoes, potatoes and other vegetables. Read More of My Articles What Does Freeze-Dried Meat Look Like? Below you can see the inside of the hopper that holds the grains for milling with the coil auger peeking up from the bottom. It comes with two different augers. One is the coil auger it is used for grinding small grains like wheat, barley and rice. 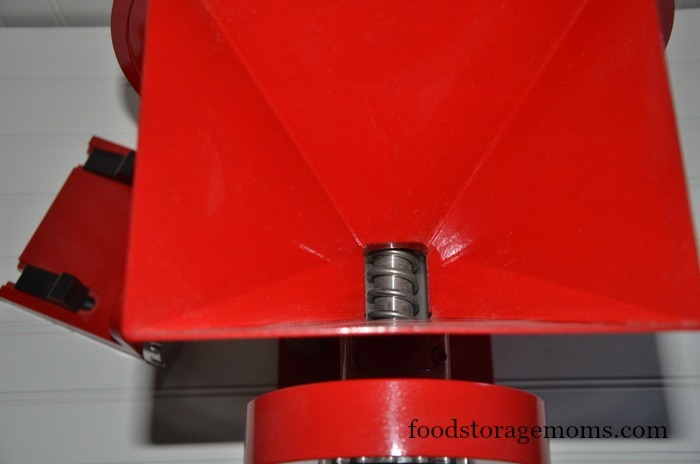 The other is the GrainBreaker auger is for grinding corn, legumes, coffee beans, dehydrated foods and nuts. Be sure and fill the hopper with wheat or whatever you are grinding before you start turning the handle clockwise. Below you can see the front burr and the stationary burr with the adjustable click and lock knob. The burrs grind or mill the grains. You can make the grain coarse or fine, it’s your choice. 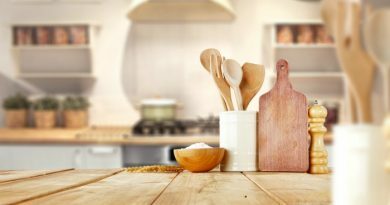 You can make cracked wheat cereal! It has a removable dust cover where the company can engrave a name or saying that is special to your family. It’s truly a family heirloom that can be handed down from generation to generation. I opted to put my name: Linda’s. I use the clamp below to secure the mill to most counter tops without damage. It works great on my counter top. Place the mill in the location that best works for you, place the clamp over the edge of the Mill base and turn the knobs until the clamp and Mill are secure. You can use some shelf liner under the mill for added grip and counter protection. Clean up is easy, I use a dry cloth to dust it and the cleaning brush provided. 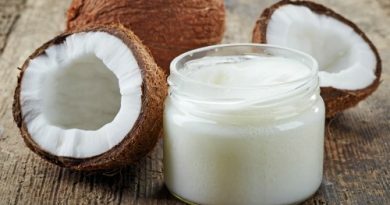 Now if you do nut butters there are more steps to cleaning it. But they are really quite easy steps, in my opinion. 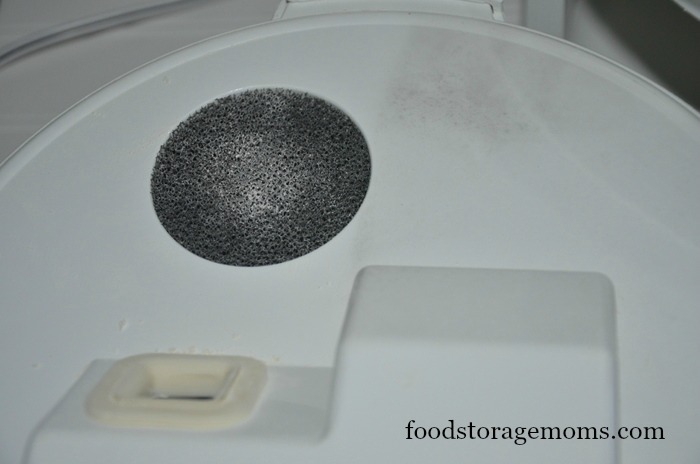 The picture below is the flour “bowl” and the gray sponge-like deal on top you will need to keep clean to keep the air flowing properly and staying cool while milling. The way I clean it is by “tapping it against the bowl” until I can see the gray sponge without excess flour. I use a soft brush to clear out the “flour” in the bowl and the chamber that holds the bowl. I never wash the bowl or lid because I use it every other week. I did wash the bowl and lid when I originally purchased it, but that’s the only time. The picture below shows the YES and NO lines. 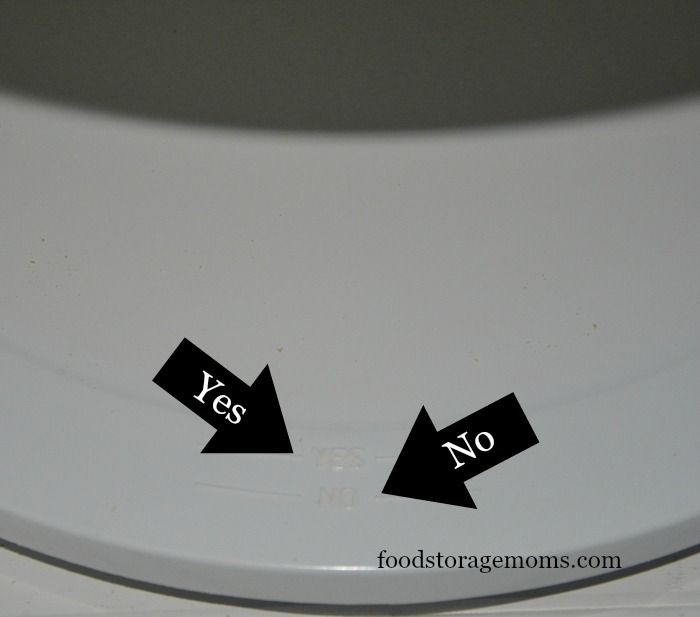 YES means the bowl is inserted in the chamber correctly. NO means you need to push the bowl in further or you will have flour blowing everywhere. Just giving you the heads-up here. It will only happen to you once……LOL! The picture below shows the buttons to turn on the mill. I never change the lower button, only the top one. I barely turn the top button counter-clockwise and the mill turns on when plugged in. You MUST have the wheat berries in the mill BEFORE you turn the machine on so you don’t damage the internal parts. I think the newer models have improved, but this one works great for me. I hope this helps you realize how easy it is to grind or mill the different grains, whether by hand or using electricity. If you can learn to make bread you can survive most any disaster or hardship that comes your way. You can barter a loaf of bread and save money every month on groceries. Let me know if you have one or more wheat grinders. I love to hear your ideas and tips. 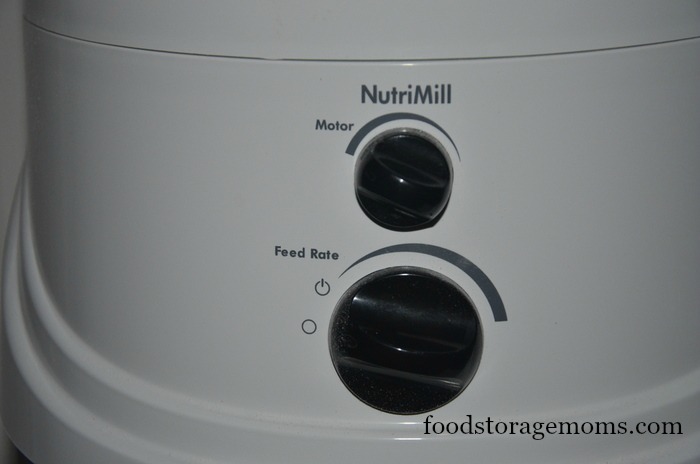 Linda, I have and use my nutrimill very often. I soon discovered that it will clog if I load it first. I always turn it on and slowly add the first cup of grain while it gets going and then add to fill the hopper. I then let it run briefly after grinding the wheat to make sure it is cleaned out before storing. When I did not do both of these steps I have to empty and clean before I could continue to use it. If I shut it off in the middle of the job with the hopper still full it would clog. It has given me many years of service when using this method. Thank You so much for this info! I really appreciate all of the help!!! Will be trying it out soon! Thank you for this info, Linda! 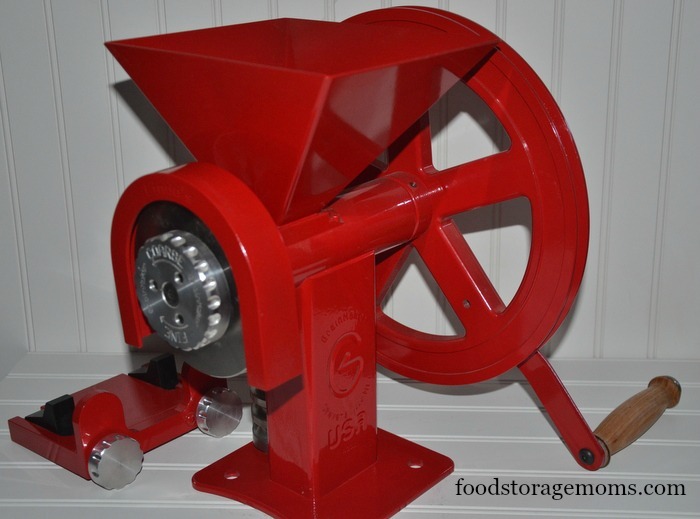 A grain mill is on our wish list. I will most likely go with the hand crank mill so that it is usable during a crisis situation. I would love to have both. we just don’t have to storage space to do so! Thank you! Would love to have your friends cornbread recipe. I grind my own wheat berries and corn. Have not come up with a good cornbread recipe with whole wheat and ground corn.